The Naztech MagBuddy Windshield Mount easily and conveniently secures your phone magnetically so you can attach and detach with just 1 hand. Made of rare neodymium magnets, this mount provides a strong, secure bond without residue, keeping your device 100% safe, even on the bumpiest of roads. 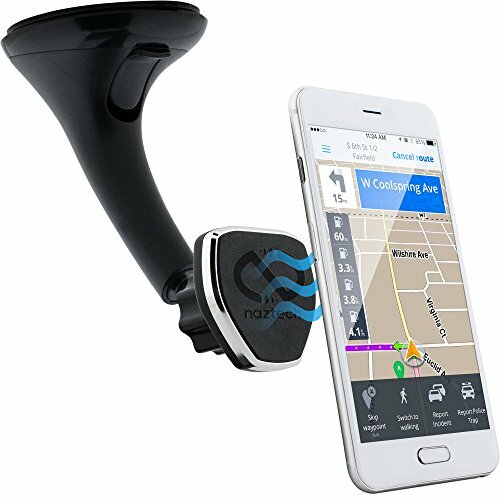 Enjoy hands-free conversations and GPS at your fingertips with this unique mount. MagBuddy Magnetic Phone Car Mount Offers the strongest grip available to securely hold your device with no vibrating or wiggling. Designed for convenient single-handed action. Mount any Device (smartphone, tablet, MP3 Player, digital photo frame) with an attractive "floating" look. There are no arms, legs, or brackets that may tangle up charger cables. Durable double-sided adhesive secures the mount to any flat surface (walls, shelves, cabinets, doors, etc.) so you can have a mount wherever you need it, whenever you need it. Avoid accidental drops and spills by mounting your mobile devices at a convenient and glance-able level.